The main purpose of this term paper is to find out the demand of the Taxi Cab. 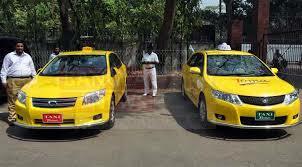 This report analyze whether the taxi cab has demand in Dhaka city. In Dhaka city population is increasing day by day. People are gathering in Dhaka from the rural area in the hope of employment. Government has taken some steps to the transport sector to give good facilities to the people to keep the environment free from pollution. For that Bangladesh transport ministry division has decided that in Dhaka city two stroke engines will be replaced by four stroke engine, special in taxi cab.